We went hands on with the latest pre-alpha build of CCP Games’ made-for-VR multi-player space shooter EVE: Valkyrie, the game you’ll receive with your Oculus Rift at launch. We had a lengthy playtest with opportunity to witness the new in-game UI and to battle it out in 5 v 5 matches – all on Oculus Rift CV1s. 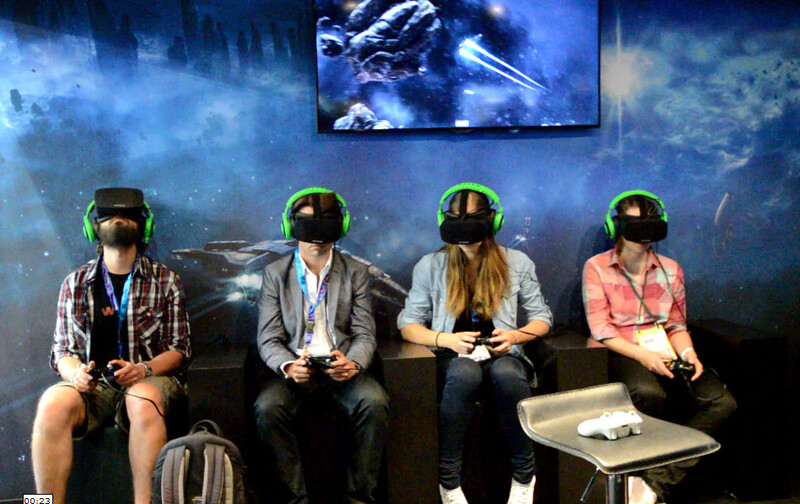 Virtual Reality is almost here … again. More specifically, the Oculus Rift is almost here, slated for releease Q1 2016, and, as with any new computing or entertainment platform, it doesn’t matter how whizz-bang those crazy boffins in Irvine, CA make the headset, the Rift needs great software to sell it. 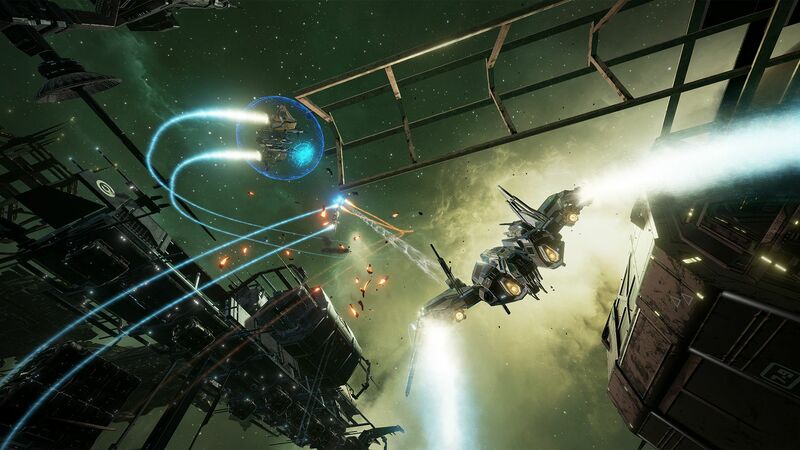 EVE: Valkyrie has been a curious constant in the Oculus Rift and virtual reality story since the beginning. 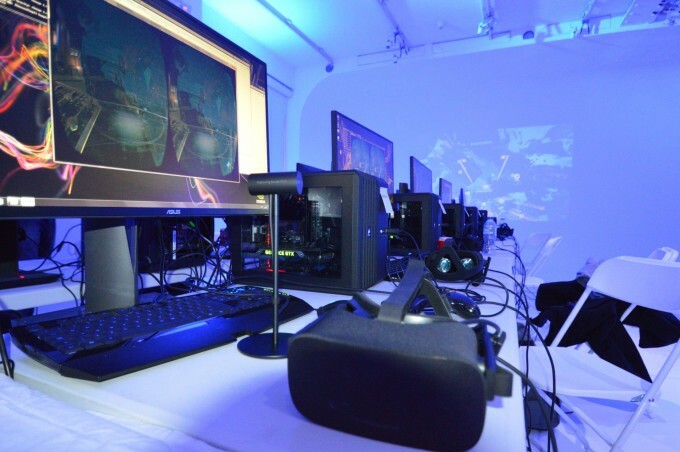 It starting life as EVE-VR, a part time project formed by a core group of VR enthusiasts at CCP Games who banded together to use the company’s 20% free-time initiative to build something awesome, in the EVE universe and in VR. After a rapturous response to the title at EVE Fanfest, EVE-VR was swiftly moved into development, handed to the internal team behind the recently completed Dust, another spin-off from the EVE universe. 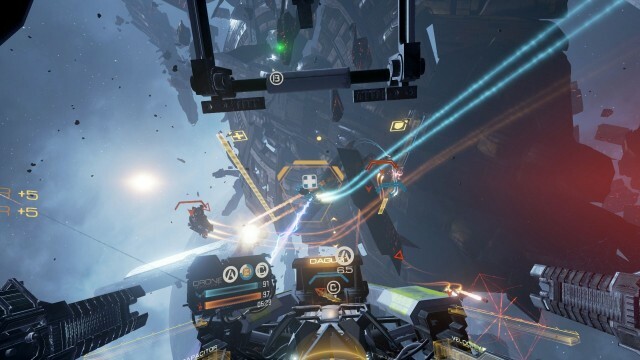 Fast forward a couple of years, a handful of Oculus hardware prototypes and some significant competitors added to the hardware race, and EVE: Valkyrie finds itself on the cusp of release alongside (and now inside) the Oculus Rift in Q1 2016. So, it’s time to stop treating the game as an impressive demonstration of how virtual reality gaming could in theory work and looking objectively at whether this is a game that will sell VR headsets. We got to dive in for a lengthy playtest at a special event in London where CCP had setup 10 gaming stations, each sporting Oculus Rift CV1 engineering prototypes, each running the latest pre-alpha build of EVE: Valkyrie, for a healthy 5 v 5 multi-player face off. This was a great chance to sink our teeth into the game proper, after so many fleeting encounters with the title at trade shows over the years. An indication of how close this title is to release, this was the first time that CCP were demonstrating their in-game menus and UI. Earlier builds apparently sported fairly perfunctory, 2D menu systems, before the team realised that in VR, the suspension of disbelief and building of immersion should start as soon as you put your headset on and start the game. So, CCP overhauled the UI, building the information and selectable options into beautiful sci-fi dioramas, in which your menu items nestle. Control is via a combination of controller input and gaze detection, with the latter not quite fine tuned yet. CCP refer to their UI design ethos as ‘AR in VR’, a neat way to illustrate the level of care the team have lavished on your interface with this virtual world and a theme which is found throughout the game. CCP had unlocked the entirety of Valkyrie’s options for this play-test. That includes character progression and customisations. Depending on context, you could find yourself hanging out in the ship’s hangar bay, pondering which decals match your mood (and choosing anything with skulls on it anyway), or deciding which ship load-out (your chosen combination of ship classes, assigned to launch tubes) you fancy, chilling in the launch bay. There’s a real feeling of presence and scale to these mini-realities, and as a way of easing players in to the virtual plane before the chaos of open warfare it works very well indeed. CCP’s game design mantra throughout EVE: Valkyrie‘s development has been to ensure that things are as intuitive as possible. This ethos manifests itself in a few different ways, but is at the heart of the different ships you’ll pilot in the game. 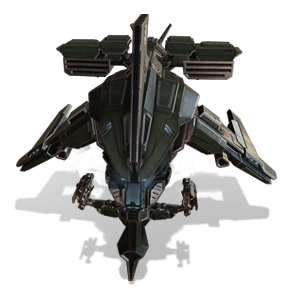 Your assault class ship, the fighter is quick with middling armour and attack capabilities. The fighter comes armed with rapid fire dual-gattling guns along with a battery of ‘look to lock’ missiles. This is the all-rounder class, the one to pick when you’re learning the ropes and the easiest to fly and fight with. The games ‘tank’ class, as the class name indicated, the ship is heavily armoured and a little sluggish as a result. However, it packs a meaty fire-power punch with a powerful shotgun-style canon, capable of delivering significant splash damage – taking out multiple close groups of enemies at once. It’s secondary ability isn’t a weapon, but a “micro warp drive” – power it up and release for a huge burst of speed – handy for getting your bulky ship in and out of trouble. The spaceship equivalent of the ‘Medic’, the support class offers shield boosting capabilities, using a multi-purpose beam to target allies in need (look for the green cross in your HUD overlay) and charge their shields. However, turn that beam on an enemy ship, and you’ll slowly drain their defences, leaving them wide open to attack. In addition to that, you have a choice of cannons and another neat dual-purpose weapon, deployable spider-bots. Drop a batch behind you and to your enemies they appear as a red mesh in the world. Fly through them and enemy ships will be covered in bots, attempting to chisel their way into the cockpit, causing damage in the process. To friendlies, the same net appears blue and those same bots will drop onto your ship, attempting repairs. However, because CCP have allowed a fairly wide gamut of customisation even within classes, meaning that you can outfit your ships to behave drastically different from another class ship. In fact, you can adjust ship properties along the path of progression which can bring crossover traits to any class. A fighter could be armoured and armed towards the heavy class for example. This potentially means that there is a combination of class and customisation potentially for any play-style – again, speaking to the levels of depth we may see in the final game. Every time you fly with a particular class you’ll gain XP for that class. Gain more XP, and unlock more ships in that class along with upgrades for those ships. You can choose any of these ships in your loadout (those launch tubes I mentioned earlier) and once a particular match is over, XP earned for each class you fly is aggregated into a central pool of XP, from which your pilot rank is discerned. So, while some of this may sound somewhat familiar to anyone who’s played almost any competitive online game in recent years, CCP have cleverly set up a framework which could yield satisfying and rewarding progression with a fair amount of depth. Long time gamers will know the feeling. When they encounter a game of real quality. Everything seems to fit just right, with actions and reactions within the gameworld playing out in ways that bring a smile to your face. That’s the feeling I got when stepping into my fighter in this latest pre-alpha. The levels of love, care and attention lavished on every facet of the world is immediately evident. From the scratches on the inside of the cockpit glass to the functional ‘AR’ display surrounding your controls to the brilliantly subtle 3D spatial audio mix, it’s clear CCP haven’t wasted their head start in VR development. Pulling heavily from the art and design built over years with EVE: Online, the atmosphere strikes a sombre tone with flashes of primary colours to distinguish this entry in the EVE canon as an accessible action title. The environments are striking and even beautiful in places, with vast space installations, mother-ships and titanic planets populating the horizon. During battle, the environment’s visual allure is less important of course, but the placement of structures become an important strategic element in gameplay. You’ll find yourself weaving in and out of skeletal constructions chasing down an enemy in a fighter, or using it as cover when choosing the slower heavy class craft, popping out to surprise your opponents. The in-game UI must receive special mention here too. Building on CCP’s vision of “AR in VR”, the holographic readouts in your cockpit have been honed to minimise the ‘fog of war’ effect, as keeping track of multiple opponents in 3 dimensional space is no mean feat. It can still be difficult when action ramps to frantic levels to know where important targets are, but this is a large part of where EVE: Valkyrie‘s challenge comes from. Tracking your mark, using boost and braking to keep him in your sights is of course the essence of dogfight based gameplay, and Valkyrie has honed this to near perfection. Hitting targets with your standard cannons can be tough when your opponent is moving at pace and EVE: Valkyrie‘s signature ‘look to lock’ missile systems, which allow you to select and track targets using your head position and poses different challenges. ‘Look to lock’ is EVE: Valkyrie‘s signature move if you like, the element that truly distinguishes it’s gameplay as ‘only workable in VR’. Hold down the left trigger and anything in your central view will be highlighted with a special retical, the longer you hold the button, the more missiles are loaded, ready for launch. Release the trigger and fiery death is unleashed, with any luck pummeling your opponent into submission. The feeling of satisfaction felt when you get it the timing right and land every one of your salvos is fantastic, bringing a broad grin to your face in the process. EVE: Valkyrie‘s gameplay feels tight and honed, and that’s not by pure chance. The development have been regular, twice weekly matches of the latest build of the game for some time now, and you can tell it’s a game that’s played and refined constantly. CCP’s hard-earned position, developing since the early day’s of VR, is paying clear dividends. CCP introduced this mode in response to user reactions at various demonstrations since inception. The pervading comments from users was that they’d really like to enjoy the spectacle of the environments CCP had built, without the risk of being shot to hell whilst admiring the scenery. Scout is essentially a VR tourist mode, which allows you to take a ship of your choice out, fly around and admire the view that virtual reality excels at providing. Scout mode is as close as it comes to a single-player campaign in EVE: Valkyrie, a resolutely multi-player focused title. Your common or garden variety multiplayer competitive mode, deathmatch pitches two teams of craft against each other with one mission objective, shoot the bad dudes – as many as possible. The most kills earns the win. A variant of the popular capture the flag mode, used in almost all competitive multiplayer games, with one important twist. The objective is to place drones designed to drain the opposing forces resources and conversely destroy the opposing team’s drones. The idea here was to avoid the ‘camp the flag’ trap most CTF modes fall into – to keep the action moving at a pace. 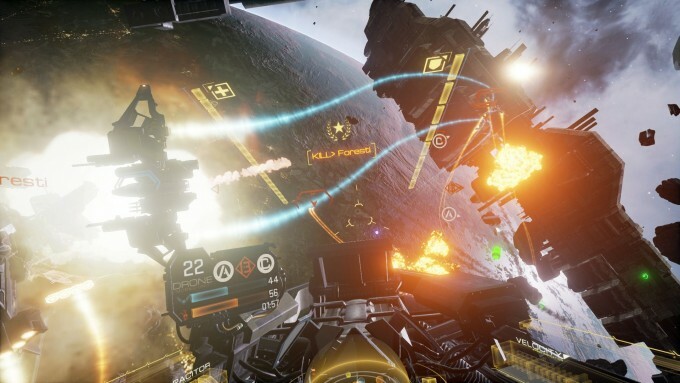 EVE: Valkyrie is the launch title that the Oculus Rift, and by turns virtual reality in general, deserves. A focused, well balanced, accessible and addictive title that provides a surprisingly comfortable way for users not yet used to gameplay inside a VR headset. At the same time, it offers gameplay unique to VR and manages to look and sound spectacular to boot. Although absolute judgement will have to be reserved for the title’s release, given our consistent positive impressions and this most recent pre-alpha hands on, it seems a good bet EVE: Valkyrie will be a favourite in your VR game collection for some time. Well I gotta say Im really disappointed with this game, I finally got to try it few weeks ago with my DK2 and for me it was just mess, chaotic action all over the place. Not addictive at all. It feels like its just very simple game with no depth which will become boring after couple of hours. Im still hoping Star citizen will be the right game from me, since Elite is such a failure so far and Eve is not what I hoped it would be. Well first time I had to quit after 2 minutes…then I tried again 2 matches for 10 minutes, then I got bored, so not that long really. I also played with Saitex x52 which might not have helped, it feel like thats overkill, gamepad might have worked better. How is the HOTAS support @@koka1n:disqus ?